The fact that the World Day against Child Labour is still marking our calendars is itself disturbing. The World Day for Safety and Health at Work also happens to be on the same day and no other event could have been a better complement. The theme of this year focusses on ensuring good health of the children involved in this social evil and ending the evil practice of deploying child labour. Globally an estimated 152 million child labourers exist; half of them, i.e., 73 million are employed in hazardous work. Child labour is increasingly becoming invisible and more vulnerable owing to enforcement of legislation and international pressure and shifting from the formal setting of factories to home-based and informal sectors along with domestic child labour. Bulk of the child labour (71%) being concentrated in agriculture and allied activities makes it more difficult to identify child labour. Child labourers are hidden from public scrutiny and work; their lives are being controlled by their employers. Although the Constitution of India guarantees free and compulsory education to children between the age of 6 to 14 and prohibits employment of children younger than 18 in hazardous occupations, child labour is still prevalent in the informal sectors. As per official statistics, in 2011 there were more than 10.2 million “economically active” children in the age group of five to 14 years – 5.6 million boys and 4.5 million girls. Incidence of child labour is more in rural India since 2 million of this number was reported in urban areas. Interestingly, incidence of child labour decreased in rural settings from 11 million to 8 million as compared to urban areas where it increased from 1.3 million to 2 million. While increased rural-urban migration can be attributed but claims of reduced instances of child labour and statistics connected with this cannot be trusted owing to the overwhelming under-reporting of child labour. The recent amendment to the CLPR Act drastically reducing the number of hazardous occupations and processes from 83 to only three allows a whole gamut of industrial employers to employ adolescent labourers under the purview of law. While the increase in the penalty and imprisonment against violations is welcome, the concept of encouraging adolescent labour along by permitting them to work in family enterprises will increase the incidence of domestic labour. The macro-economic repercussions of this cannot be ignored. 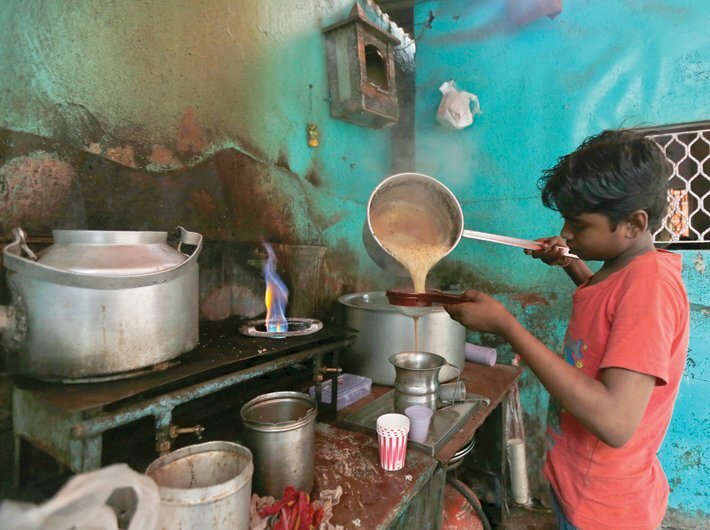 India tops in employing children in hazardous environments globally with 2.4 million children aged 15-17 years (ILO’s World Report on Child Labour, 2015). Of course, what is often not recognised is that the same amount of eligible workforce is being deprived of the employment by deploying children in lieu of cheap labour. While a set of constitutional and judicial provisions exists for prohibition of child labour; inadequate as they may be, the societal view on child labour is disturbing. Issues related to enforcement of law are well known and much is written about and researched on. The ignorance of the whole society on the socio-economic effects of increasing child labour in a nation in place is a major driving force. A shocking bitter truth about Indian society is the commonly accepted belief about age-old tradition of labour as the only source of livelihood for some sections of the society. Early employment of children in income generation activities of the household (mostly in the primary sector) for generating profits at lower production costs is very common. Inclusion is at the core of the 2030 Agenda for Sustainable Development which led to the addition of a separate target under the scope of forced labour to deal with Child labour unlike the MDGs. Increasing incidence of child labour is a clear shortcoming in several of the SDGs as poverty eradication (SDG 1), education for all (SDG 4), good health (SDG 3), and decent work for all (SDG 8). Hazardous child labour causes irreversible damages to the growing bodies of the young kids and will make the targets of SDG 3 even more difficult to achieve. Several other worst forms of child labour in contrast with the right to education and deprives them from availing their basic right of education. Almost a third of children of the developing world fail to complete even four years of education demonstrates the same. • Reporting immediately to police or other agencies on cases of child labour witnessed. The the emergency phone no. 1098 for children in need of aid and assistance can be dialled or 100 to report it to police. • Not employing any child in our own homes and offices and ensuring proper age verification systems are in place to prevent employing of children. • Not associating with brands known to employ children. This day marking the 20th Anniversary of the Global March Against Child Labour is a sign that more needs to be to done to tackle child labour rather than just having laws and regulations in place and dedicating calendar days. Agarwal is programme officer with Public Affairs Centre, a not-for-profit think-tank based in Bangalore.